Oak savanna, dune, prairie and prairie fens. In sandy soil found with Andropogon scoparius, Arabis lyrata, Aster azureus, Arctostaphylos uva-ursi, Euphorbia corollata, Liatris aspera, Phlox pilosa, Tradescantia ohioensis. Various subspecies cover most of North America. Simple or branched perennial to 40 cm. Leaves oblong, subopposite, lighter on the underside. Flowers small, perfect, epigynous, in compact, terminal, cymose-paniculiform inflorescence; petals lacking (? ); sepals (tepals?) 5, white to greenish; hypanthium well developed. Semi-parasitic on the roots of other plants. 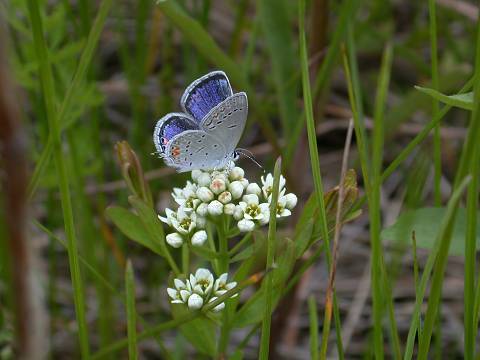 The flowers seem to attract eastern tailed-blues (Everes comyntas). These little gems rub their hind wings together continuously when at rest (image 7), which made getting the first picture a real challenge.